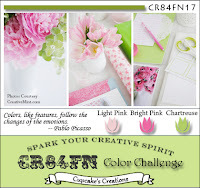 Thanks for stopping by, it's time for another wonderful color challenge from CR84FN! This weeks colors are Light Pink, Bright Pink and Chartreuse, grab your stamps and play along! A special thanks to Stella for joining us this month as our Guest Designer! 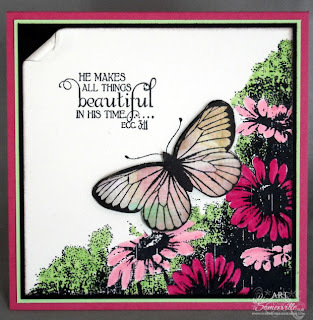 I stamped the Butterfly Corner from Our Daily Bread Designs in Black Archival on Vanilla card stock, then used Markers to add color to go along with this weeks challenge. I stamped the Single Butterfly on a scrap piece of Prima pattern paper, then die cut it using the Butterfly Die, and popped it on dimensionals over the stamped image. To finish my card, I added the sentiment from the Faith Set, and rolled the top edge. Here's this weeks color inspiration, we'd love for you to play along with us at CR84FN, you can find all the details here on how to enter. If you upload to any online gallery please use keyword CR84FN17 so we can find your creations! STUNNING card Lisa! That butterfly is gorgeous and I love the beautiful flower garden! This is so gorgeous - I love the way the butterfly is rising from the flowers, and such a beautiful sentiment too! Lovely! This is a lovely contemplative card - the sentiment is perfect for the image, beautiful. Beautiful! Lovely design! The rolled edge is the perfect balance to the image. Beautiful coloring! Your card is gorgeous, the stamped corner is amazing with the colouring. Beautiful colors this week, luv the darker pink. Beautiful corner stamp! and your addition of the additional b'fly is perfecto! Lisa, a FABULOUS, stunning creation! I love the colored flowers and that BEAU-TI-FUL butterfly! What a magnificent inspiration card!!! Such a gorgeous card, Lisa! Your butterfly garden is stunning and the verse is a perfect sentiment here! Beautiful colors! The butterfly and flowers are so inviting of Spring! Love this! I love the way the black just grounds everything... makes the pink and green just pop. The butterfly is gorgeous, this whole card is beautiful! Just BEAUTIFUL, Lisa! That butterfly looks like it is flying off the page! LOVE the flowers, too! Love this, Lisa! The colors are sensational! I love the butterfly's wings! I almost said "angel's" wings! The flowers certainly pop off the page! THis is so stunning Lisa! I love the black ink against the pretty color palette. Thanks so much for the CR84FN 17 inspiration!